We will continue from our first part of survival guide to Los Angeles Anaheim Disneyland with more tips on how to make the most of your time in Disneyland and have fun checking out fun attractions in the park. Tip 1: Make Use of Disney Fastpass to Save Queuing Time! Disney Fastpass allows you to plan your day around Disneyland Park by giving you a time where you can come back to a specific attraction and start your adventure with little or no waiting at all. 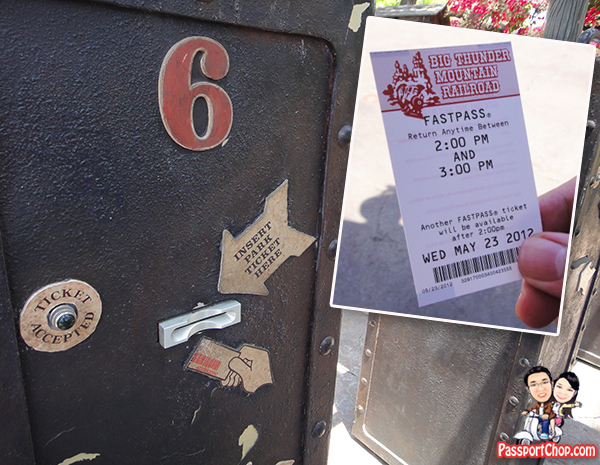 Fastpass is free and available to all Disneyland Park ticket holders but is only available at selected attractions. Current attractions where Fastpass is available, include Big Thunder Mountain Railroad (a roller-coaster around the hills of Frontierland), Splash Mountain (be prepared to get wet! ), Indiana Jones Adventure, Space Mountain, Star Tours – The Adventure Continues (we highly recommended this!) and Autopia (the all-time favorite of many Disneyland park goers). To get your Fastpass, each member of your party (assuming all are going on this specific ride) inserts his/her Park ticket into the Fastpass kiosk. You will receive a Fastpass ticket with a return time so you can explore other parts of the Park or take other rides instead of waiting in line. Come back during your return time and go on the attraction with little or no waiting as Fastpass queues are typically short. There is no upper limit to the time you can return for the ride, while the Fastpass ticket will indicate “Return anytime between 2pm to 3pm”, you can return anytime after 2pm. Based on points 3 and 4, one possible “strategy” to consider is to (specifically at Tomorrowland), take a Fastpass (if the queue is long – more than an hour wait – the waiting time is indicated) at Star Tours and then check out other attractions e.g. Finding Nemo Submarine Voyage or explore other attractions in Adventureland. When the Fastpass timing for Star Wars is due, take another Fastpass at Indiana Jones Adventure. Have fun at other attractions and return to cover the Fastpass attractions e.g. Star Tours and Indiana Jones towards the end of the day. 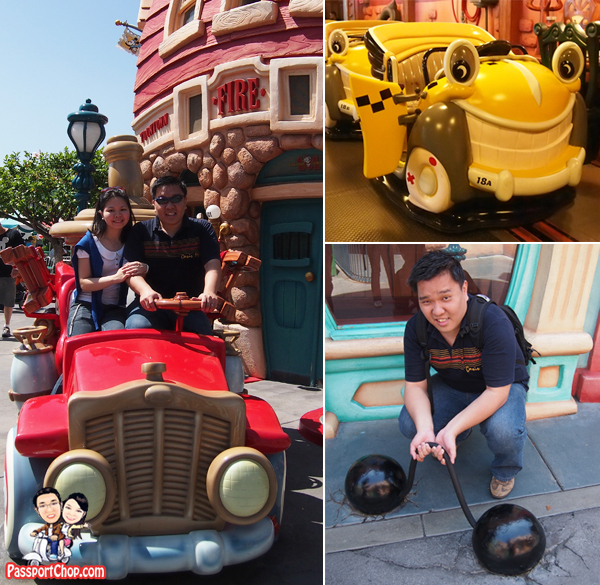 While each of the Disneylands have their Tomorrowland and Fantasyland; Mickey’s Toontown is unique to just California Disneyland and Tokyo Disneyland. So this is a must-see if you are here in California Disneyland. Skip the Roger Rabbit’s Car Toon Spin in Mickey’s Toontown or take a Fastpass as the ride experience is definitely not worth the wait. Mickey’s Toontown offers lots of photo opportunities with the unique building designs and architecture which looked as if they just popped out of the cartoons. Also look out for tongue-in-cheek signs like the one below around the town. 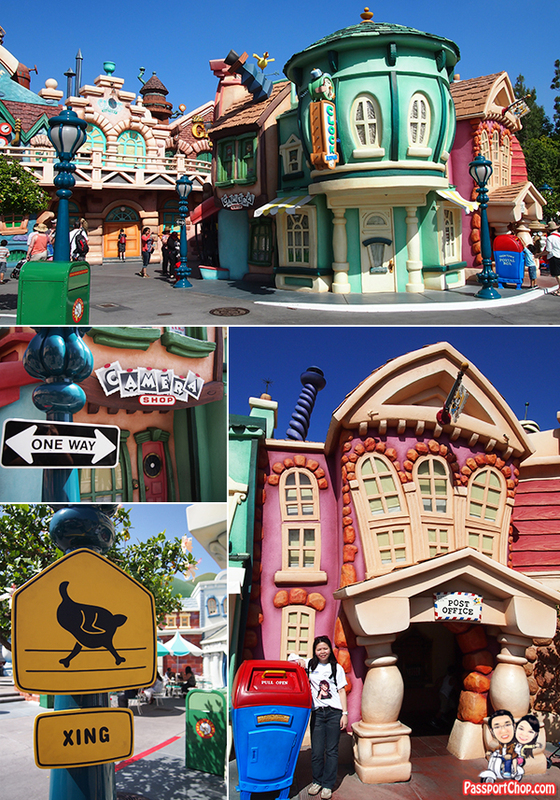 There are lots of interactive experiences in Mickey’s Toontown – goof around with their various props and try out everything that you can interact with e.g. trying to open up the postbox (see picture on top) will yield some strange cartoony noises. Try to open the door to the Electricity Power Station and hear what happens! 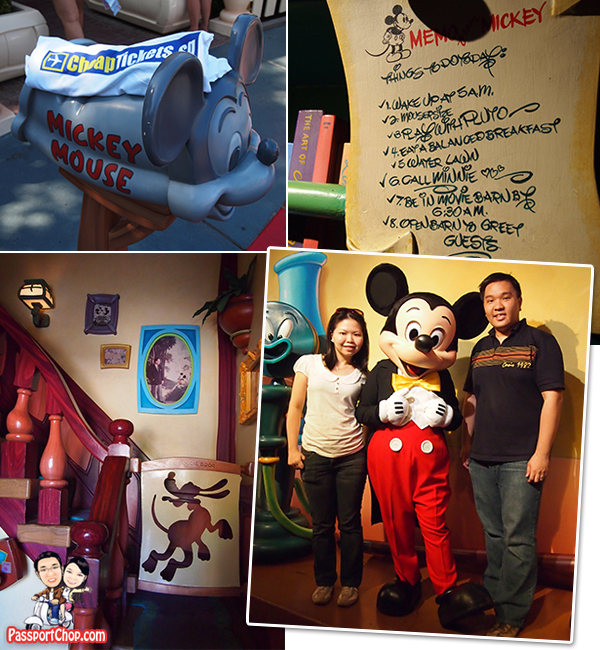 Also at Mickey’s Toontown, you will find Mickey’s House – it is like a museum of all Mickey Mouse related stuff – everything you will expect to find in his house e.g. the brooms and mops from the Mickey’s magician cartoon episode, Mickey’s slippers which had been chewed to bits by Goofy. The best part of it all – you also get a photo op with Mickey Mouse but as the queue is hidden deep in the house – you will have to walk through his house to find it – not a lot of people know this and thus the queue is quite short! We waited just 10 minutes!! That’s very fast for the hot favorite character in Disneyland. Unlike Mickey’s House, the Minnie’s House photo op is right in front of Minnie’s house. Expect super long queues to take a photo with Minnie and then to go into her house. But if you just want to check out Minnie House (which is considerably much smaller than Mickey’s House), go in via the backdoor – this is accessible via the path between Mickey’s and Minnie’s House. 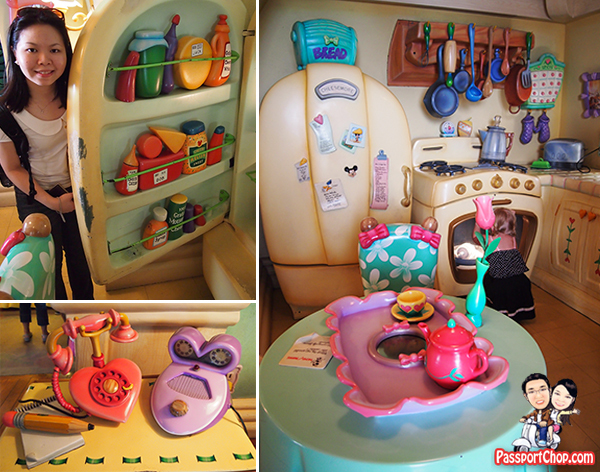 Check out her very cute and interactive kitchen! 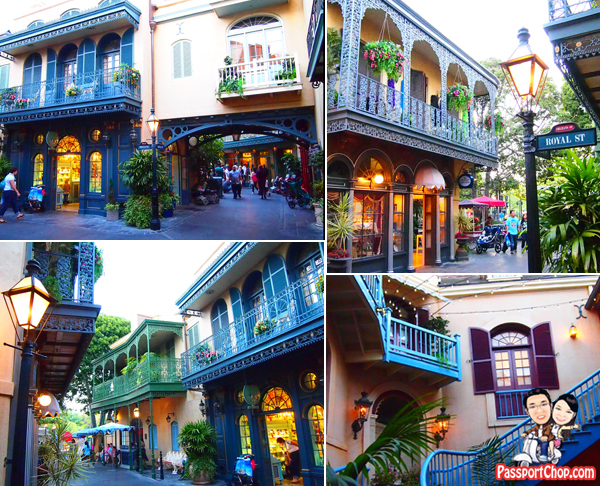 The sights and sounds of the historic French Quarter are recreated in California Disneyland New Orleans Square with the picturesque courtyards, lacy wrought iron balconies, the swing of jazz bands and smell of down home cooking. Everything about the architecture invokes the grace and elegance of the Old South, with its lazy summer days and vibrant nights. The style is influenced by a comely combination of French, Creole, Cajun and American traditions. Last but not least, you should not miss out the popular Mickey’s Soundsational Parade. During summer weekdays (Mon to Thur), the parade starts at 7pm – check Disneyland Park website for actual timings on other periods of the year and week. The crowd will already start to form along the parade route by 6.30pm so to ensure yourself the best seats, pack your picnic mats, snack and standby along the route by 6.15pm. We will conclude our survival guide for a fun day at California Disneyland with this video of the awesome Mickey’s Soundsational Parade. For flights to the States, you can consider CheapTickets.sg multi-stop trip functionality which effectively serve as a one-stop for us in planning our flights from Singapore to Los Angeles and internal flights to Las Vegas and finally from San Francisco back to Singapore. Please click on link for our USA West Coast trip itinerary. Great tips, but I think the best tip that could be given for those who plant o visit Disneyland is to avoid holiday season as much as weekends. You can a lot time with your family on regular days to fully enjoy the park.